Heroes of Might and Magic V is a turn-based strategy video game fully rendered in 3D and the game art features classic fantasy creatures in an epic world setting. The story arc is covered in the original Heroes of Might and Magic V game and two expansions, Hammers of Fate and Tribes of the East. A significant sidestory is explored in greater detail in the first-person fantasy role-playing video game Dark Messiah of Might and Magic. This page has fantasy art, game scenes, cutscenes, and gameplay movies from Heroes of Might and Magic V: Hammers of Fate - campaign 1 "Wulfstan's Defiance" mission 5. The mission is structured to allow time for the heroes to explore dwarven territory and collect powerful relics before going against Laszlo. Laszlo, who starts with a powerful army, is blocked in the southeast by a stack of over one thousand phoenixes, thus preventing him from charging out and flattening the heroes in the early weeks. However, early victory is possible with strong magic even with weak forces. Two of the movies in the playlist below are combat replays showing early victory (satisfying the conditions of capturing Horncrest and defeating Laszlo) using only slightly more than the initial forces assigned to Wulfstan and after just under two weeks of exploration. The battle against Lazslo is definitely not optimal, as more units might have been saved if the Rune of Ressurrection had been employed more liberally. Note that Hammers of Fate does not have combat and video replay functions. 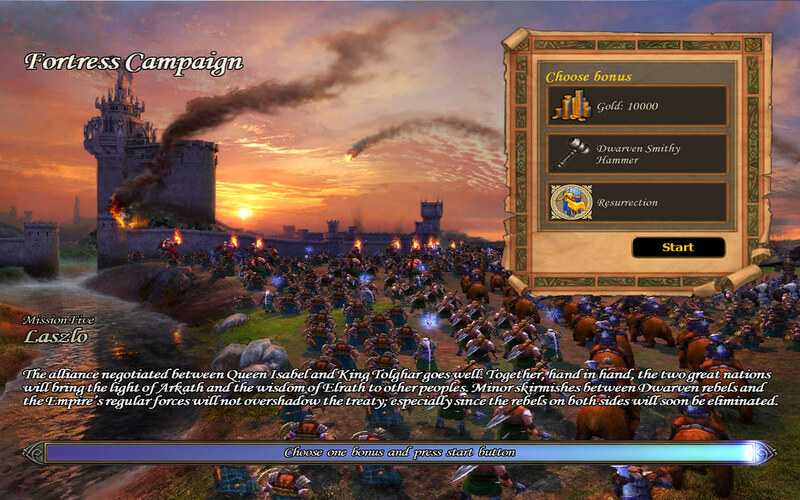 Combat replays from Hammers of Fate were done by playing Hammers of Fate using a mod that allows playing the campaigns in Tribes of the East.